UNIPEG Soc.Coop.Agricola is the leading beef and veal cooperative in Italy. The cooperative was founded in 2004, by two leading Italian companies, Unicarni Reggio Emilia and Pegognaga; these blue chips have been offering high quality fresh and frozen meat products for more than 50 years. The cooperative has 1,000 members, 600 employees, two processing plants and does € 400 million of revenue per year. UNIPEG operates in the region of Italy famous for its fine food including balsamic vinegar, authentic Parmesan cheese labelled Parmigiano-Reggiano, and prosciutto air-cured ham. The UNIPEG brand stands for high quality beef product: beef with bone, boned beef, portioned and packaged beef, and beef for fresh and frozen industrial processing. In the 2011, UNIPEG’s Chief Technical Officer, Lino Bellochio, determined that their current Antivirus and Anti-spam solution for email was not meeting the company’s needs in terms of accuracy or ease-of-use. Too much spam was getting through the mail filter, the system was generating too many ‘false positives’ and end-users as well as systems administrators didn’t have a convenient way to access and resolve emails that had been sent to Quarantine. UNIPEG has implemented CommuniGate Pro as its email system. Communigate is one of the most comprehensive Unified Communication & Collaboration solutions on the market. Communigate offers traditional groupware functionality – email, contacts, calendar, tasks – combined with Instant Message, Presence and VOIP or Voice-Over-Internet-Protocol in one solution. UNIPEG runs Communigate Pro on Windows 2003 Server on a VMWare virtual machine for 200 users. Most users use Outlook as their email client. UNIPEG decided that they needed an AV/AS solution with a long history of Communigate Pro compatibility, the highest level of performance and accuracy as well as ease-of-use characteristics at a reasonable price. For this reason, they contacted Answer Srl, Mailspect’s Exclusive Distributor in Italy and requested a proposal for Mailspect Defense Standard with Cloudmark Anti-spam and Antivirus for 200 users. Mailspect offers a multi-layer filtering and security solution for Linux and OS X email servers and gateways that integrates best-of-breed antivirus and anti-spam engines with content filters, real-time black lists, SURBL and a state-of-the-art quarantine module. One of Mailspect’s architecture advantages is that it blocks 90% of all ‘raw’ spam using multi-layered real-time black lists and access control lists before it is processed by the scanning engines, in this case Cloudmark, SURBL and Mailspect’s proprietary content filter. Consequently, Answer SRL installed Mailspect Defense on a front-end server to increase the performance versus the UNIPEG’s previous solution which handled spam in the mail server. 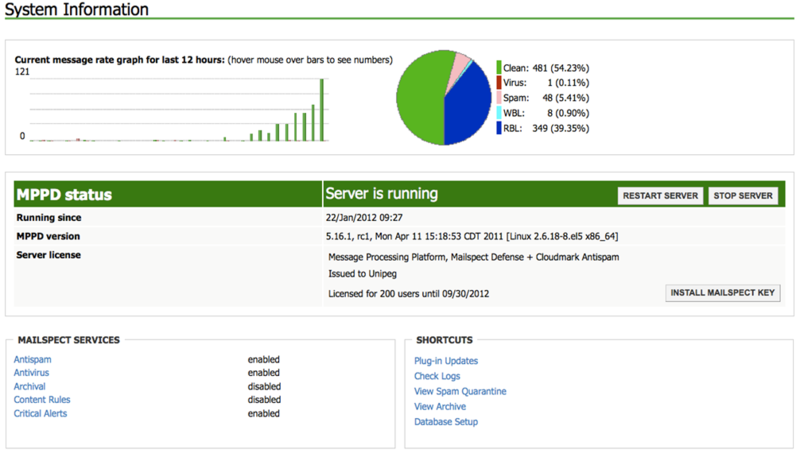 The new architecture reduced the processing load on the email server and sped up the responsiveness of Communigate Pro. In addition, Cloudmark improved the accuracy of spam detection and reduced ‘false positives’ versus the previous solution. Mailspect’s quarantine module greatly improved user satisfaction because it gave them secure access to all quarantined emails and eliminated the risk of losing or deleting a email marked as ‘probable’ spam by the mail filters. End-users appreciate Mailspect Defense’s new user interface that provides an easy-to-access and intuitive quarantine solution that is accessible via browser or email alert. End-users can Remove, Deliver, Forward, Reply, Save to Desktop, Export, Report False Positive, Print, or Add to Whitelist or Blacklist with one mouse click. Mailspect Defense organizes system entitlements and/or permissions based on four roles or levels within the quarantine module which allows for effective systems management: system administrator, domain administrator, group administrator and end-user. Giving administrators access to the quarantine back-end for all of the users within their policy group allows the help desk to more quickly solve problems or misunderstandings remotely for end users. The image below shows Mailspect Defense removing 40% of UNIPEG email stream as spam using real-time black lists before it enters the scanning engines. This architecture optimizes system performance and speeds system throughput.